This unique boy’s LEGO birthday party includes all the fun of LEGO building plus the excitement of Spinjitzu. A party so full of opportunities to design, build, and even take home a little of the magic of LEGO Ninjago is a dream come true for any LEGO enthusiast. Bright colors, simple patterns, and the larger-than-life faces of favorite Ninjago characters add up to ample inspiration to create and celebrate. Christine, at SimplyIced, summed up all the best aspects of LEGO and Ninjago in the over-sized LEGO brick backdrop, carefully-created cake pops, unique mini figure-shaped crayons, and adorable favor bags. Take a peek at this picture-perfect boy’s birthday party to see how she did it and decide whether your favorite parts are classic LEGO or LEGO Ninjago. 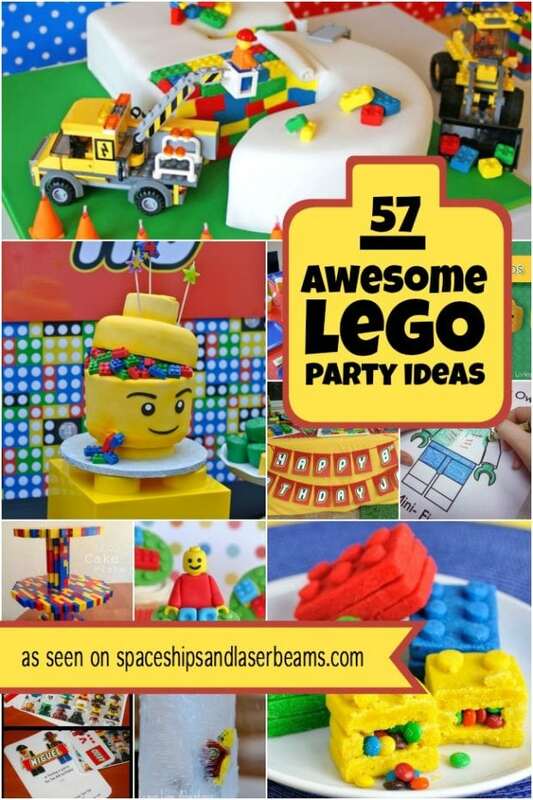 Your building fanatic is sure to love this LEGO themed birthday party idea. This party is a treat for the eyes! The vivid, cheery LEGO look is breezy and bright and sparks the imagination. Bright white tablecloths keep all the attention on the carefully executed theme. At the dessert table, the clean lines of the backdrop and a simple pennant banner frame party goodies like Cake Delirium’s impressive ninja cake and adorable ninja cake pops by Party Sweetness, creating a striking presentation. I love that Christine chose to use her son’s own LEGO Sort & Store (that’s the giant, yellow head!) as a centerpiece. Are you in awe of those oversized Lego bricks built up as a backdrop? Christine wrapped juice boxes in solid gift wrap, wrapped foam disks separately, and then attached the disks to the box tops with double-sided tape. Carson’s expertly sculpted cake looks deceptively like a real LEGO base and Ninjago figure. Featuring the white ninja, Zane, with The Shurikens of Ice weapons, this stunning cake was made to the specifications of the birthday boy himself. For the cake pop display, smart mom Christine kept it simple with plain black boxes accented by a simple ribbon to keep the spotlight on the treats. I can’t stop looking at those Sensei Wu cake pops. Delicious A Cupcake Heaven cupcakes were topped with fondant peering ninja faces and LEGO bricks by PastryChefJodi. At the activity table, guests helped themselves to some “Ninjago water”, customized with labels by CutiesParties, before settling down to design their masterpieces. LEGO “color and drink” juice was also offered to defend guests against dehydration (should any of the building sessions reach epic proportions) and to wash down all those delicious party goodies. Christine used picture frames to designate each activity station and cleverly reused retailer display boxes to keep everything organized. Christine made these extraordinary LEGO mini figure crayons using a mold. I love multi-use party goods, and these guys looked great scattered on the activity table as decorations, were useful tools for the coloring activity, and also made their way into guest bags. Topped with a little touch of Ninjago, LEGO guest bags were pre-filled with goodies and treats: sweets, those cool LEGO crayons, and a car or plane kit. Little constructors also used the bags to carry home their make-and-take party favors. This boys LEGO Ninjago birthday party was a builder’s paradise. Christine’s inspired simplicity allowed Carson and his guests freedom to use their imaginations and express their creativity to the fullest; isn’t that every little architect’s dream?